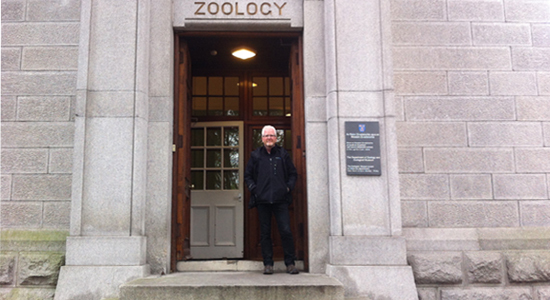 The top photograph shows Ciarán Walsh in the doorway of the Zoology Dept. TCD. It was taken in December 2015 by Siobhan Ward, Chief Technical Officer in the School of Medicine TCD. 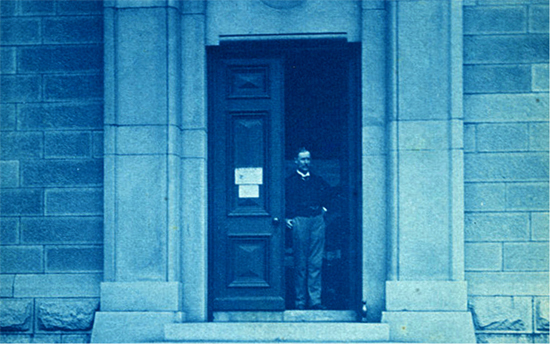 It recreates the photograph (below) of D. J. Cunningham, Professor of Anatomy TCD, that was taken in the same spot 125 years ago. Walsh and Ward are working together on the resolution of the collection of the Anthropometric Laboratory TCD that was discovered in 2014. Ciaran Walsh is a freelance curator and is currently engaged in postgraduate research with Maynooth University (Anthropology PhD Programme, Dr Mark Maguire) in association with TCD School of Medicine ((Prof Martina Hennessy) and a research fellow with Kimmage Development Studies Centre (Dr Rob Kevlihan). The project is funded by the Irish Research Council under its Employment Based Postgraduate Research Programme 2015 – 2020. Ciarán Walsh is a graduate of NCAD (1984) where he specialised in arts education. He has worked in a number of educational contexts including Triskel Arts Centre and the Arts Council. He joined The National Folk Theatre as Visual Arts Director in 1995 where he worked until June 2010. 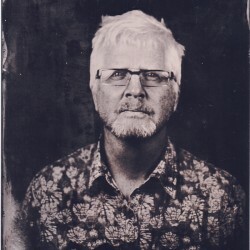 In 2008 he completed an MA by Research (HETAC) and in 2010 he established www.curator.ie as a vehicle for innovative arts, heritage and media projects. 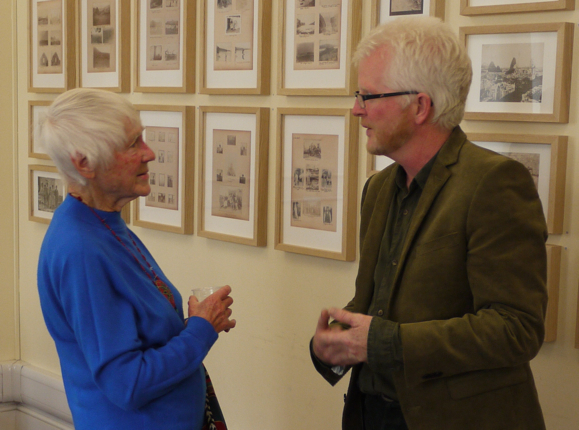 Margaret Rishbeth, granddaughter of Alfred Cort Haddon, and Ciarán Walsh at the opening of ‘The Irish Headhunter’ in the Haddon Library, University of Cambridge. In 2013 he developed the critically acclaimed ‘Headhunter’ project in association with Trinity College Dublin and The Great Blasket Centre, with funding from the Heritage Council of Ireland and the OPW. This led to the discovery of significant new material relating to the Irish Ethnographic Survey (1891-1903) in the “old” Anatomy Building TCD. In 2014 the Irish Research Council agreed to fund a 4 year programme of postgraduate research with Maynooth University (Anthropology PhD Programme) in association with TCD School of Medicine and Kimmage Development Studies Centre (KDSC). The funding was provided by the Council under its Employment Based Postgraduate Research Programme. In 2015 he was elected a Fellow of the Royal Anthropological Institute of Great Britain and Ireland. In 2016 he was appointed as an associate of TCD School of Medicine. Published work includes an essay on the photography of R. J. Welch in Framing the West, Irish Academic Press, 2007, Ed. Dr. Ciara Breathnach. He published The Stuccowork of Pat McAuliffe of Listowel by Sean Lynch in 2008. The essay Níl Scoil Phéintéireachta Gaelacha Againn Fós was published in Shorelines (2010) by Memorial University Newfoundland. 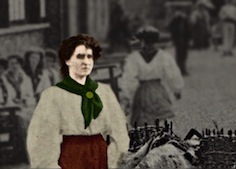 Irish Headhunter, The Photograph Albums of Charles R, Browne was published in May 2012. An essay on the photography of J. M. Synge was published in Céiliúradh an Bhlascaoid Mhóir 14 in 2012. Charles R. Browne. 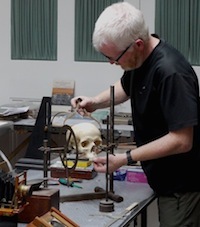 The Irish Headhunter was published in the Irish Journal of Anthropology Vol 16 (1) 2013 and An Island Portrait (photographic editor) was published by Collins Press in May 2013. He is currently working on a series of articles on Alfred Cort Haddon and the Irish Ethnographic Survey (1891 – 1903). Ciarán Walsh approaching the Blasket Island on 10 July 2013. Photo by Padraig O’Donoghue. Ciarán Walsh is married and lives in Ballyheigue, Co Kerry, in the south west of Ireland. He is a member of Tralee Mounteering Club, a Kayaker and an occasional cyclist.